Moving time: 4 hr 34 min. 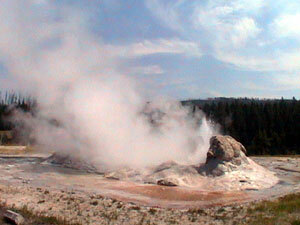 Weather: 50°F (10°C) in the morning; got up to 82°F (28°C) by the end of the ride at 3:00 pm. Partly cloudy. What an outstanding day! I rode with Joe all day and Chris from time to time. The first stop was the West Thumb area which gave us a sneak peak at the geothermal features that we would encounter all day long. I crossed the Continental Divide two more times early in the day. After that it was all down hill to the end of the ride. 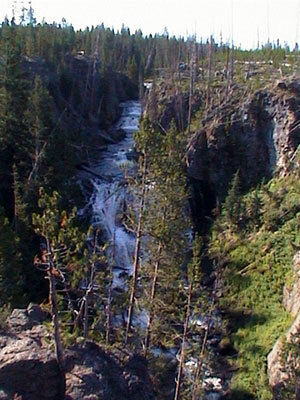 I stopped to take this picture of a waterfall along the Firehole River. 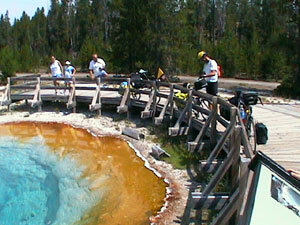 Yellowstone National Park features hundreds of waterfalls in addition to the geothermal wonders. 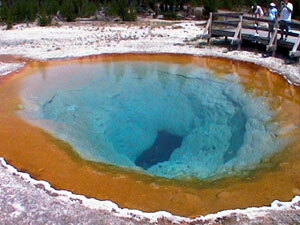 Here are some pictures of the Old Faithful, Grotto, and Castle geysers as well as the Morning Glory pool. 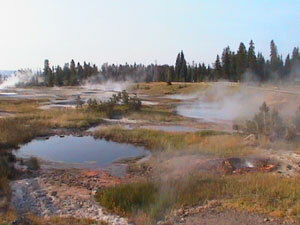 We said goodbye to Chris at the Lower Geyser area since he was heading north through the park and up to Glacier National Park on his way to Calgary, Alberta. 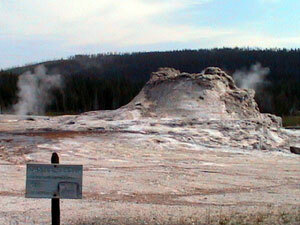 The animal life in Yellowstone is quite unique. There are black and grizzly bear, elk, moose, trumpeter swan, and other mammals that I would never see in Central Pennsylvania. 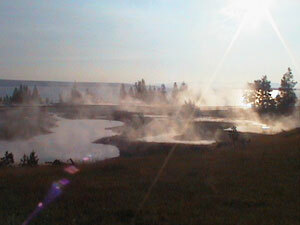 This morning I was awaken by the sound of trumpter swans on Lake Yellowstone. 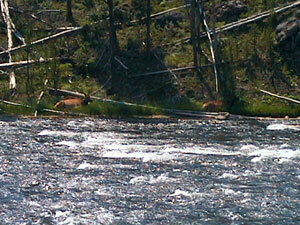 The first picture shows two elk resting along a stream and the second is of a moose in a swamp. I wish I could have taken a picture of the entire moose but he laid down in the water to cool off and rest just before I arrived. 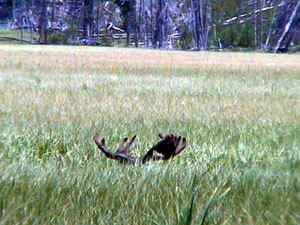 Joe and I waited for about fifteen minutes but the moose didn't stand back up. The hundred or so people who showed up to view the spectacle may have scared him into laying there longer than he had originally intended. I crossed another state border today - Montana. This is the eighth state on the journey. Here's a picture taken by Katie, an eastbounder who we met right at the border. There's nothing like having another cyclist perform photographer duty. 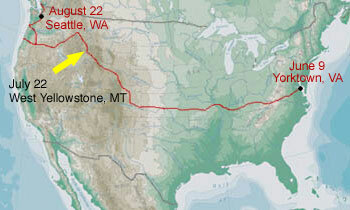 Katie started in Seattle and has been on the road for 24 days. I have 32 days to reach the same point so I certainly have plenty of time as long as everything goes as planned. We saw another eastbounder but he didn't seem interested in talking. He had an enviable tailwind and obviously didn't want to break stride. It's common for people not to stop if they are going downhill or have a fast tailwind. 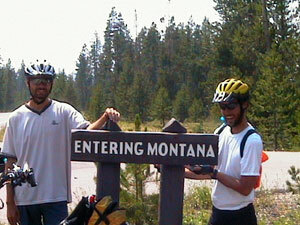 There were two other eastbounders at the bike store in West Yellowstone. Kelly Yeagle and Pat Pierre, two friends from college, met me and Joe at the motel. They are on an adventure of their own as they drive around the country during their summer vacation. It sure is great seeing familiar faces. 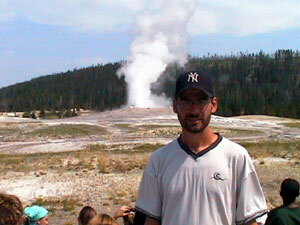 We all went shopping and had dinner in West Yellowstone.